With just one hour of "Alta velocita'" (high speed) Frecciarossa train, from Rome, they were in "La Citta' del Sole" (the city of sun), Napoli. Hometown of Andrew, whose family is from Napoli in uncountable generations, even if he could live there just few years of his childhood, as soon as he arrived in the city he felt home. And couldn't be differently having warmest welcome of a cousin and his son who came to pick the couple up at the train station. Was by a little over 1 pm, the mandatory stop for lunch became a homemade banquet based on mozzarella, friend stock-fish, fresh pasta with seafood and different kinds of pastry. After a righteous coffee and some lemoncello (sweet liquor of lemon) Mai and Andrew were just impatient to go visiting the city. After trying to convince them to take a rest, their guest were happy surrender t their wills and drove them trough the chaotic beauty of what in the eyes of every Neapolitan (and not only) is just the most beautiful and unforgettable city in the world. Laying on one of the most fascinating gulfs in the world (the gulf of Napoli) and at the feet of the volcano Vesuvio (Vesuvius), the sight of the city is something that leaves easily breathless. "Vedi Napoli e puoi muori" (You see Napoli and then die) says a ancient aphorism, meaning either that after you have seen Napoli there is nothing else better you can do in your life or that you should not die before seeing Napoli. One of the oldest continuously inhabited cities in the world, Greek settlements were established in the Naples area in the second millennium BC. The city was refunded as Neápolis in the sixth century BC and played a key role in the merging of Greek culture into Roman society and eventually becoming a cultural center of the Roman Republic. Naples remained influential after the fall of the Western Roman Empire, serving as the capital city of the Kingdom of Naples between 1282 and 1816. Thereafter, in union with Sicily, it became the capital of the Two Sicilies until the unification of Italy in 1861. Thanking the guide of Andrew's cousins, the two could immerse in the city wandering by car from a side to another of the city, walking on the seafront areas, going for coffee and pastry at the Gambrinus ( historic, private cafe or coffeehouse in Central Naples) and for shopping next to Piazza Plebiscito, visiting the monastery of Saint Chiara and the artistic ceramic "presepe" artworks areas, having pizza in Vomero. During the trip, they elected a few spots for their honeymoon album and prayed for a sunny morning the day after. 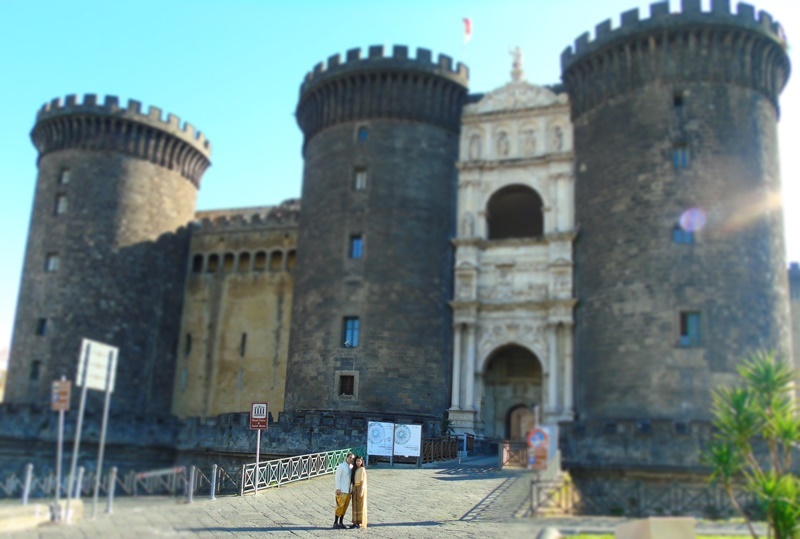 Maschio Angioino, one of the city's foremost landmarks was built in 1279, during the time of Charles I, the first king of Naples. 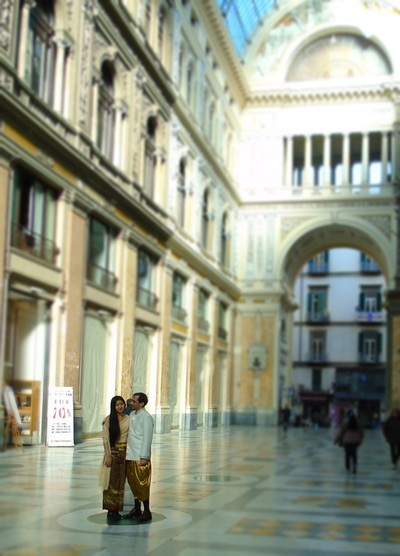 Located in front of Piazza Municipio and the city hall (Palazzo San Giacomo). Under king Robert (reigned from 1309), the castle was enlarged and embellished, becoming a centre of patronage of art. Under the Aragonese dynasty, begun by Alfonso V in 1442, the fortress was updated to resist the new artillery. A famous triumphal arch, designed by Francesco Laurana, was added to the main gate to celebrate Alfonso's entrance in Naples. The decoration was executed by the sculptors Pere Johan and Guillem Sagrera. 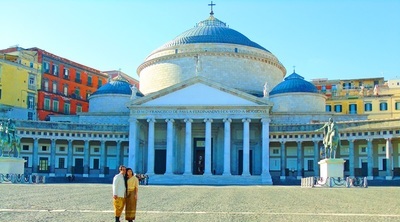 San Francesco di Paola is a church located at the west side of Piazza del Plebiscito, the city's main square. In the early 19th century, King Joachim Murat of Naples (Napoleon's brother-in-law) planned the entire square and the large building with the colonnades as a tribute to the emperor. 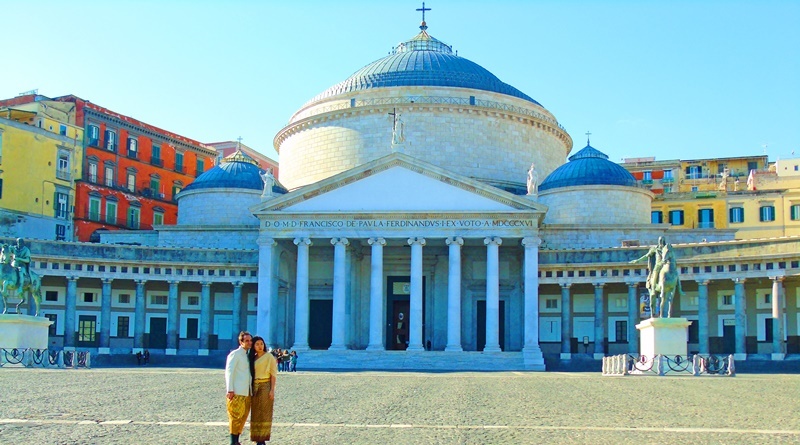 When Napoleon was dispatched, the Bourbons were restored to the throne of Naples.Ferdinand I continued the construction - finished in 1816 - but converted the final product into a church dedicated to Saint Francis of Paola, who had stayed in a monastery on this site in the 16th century. 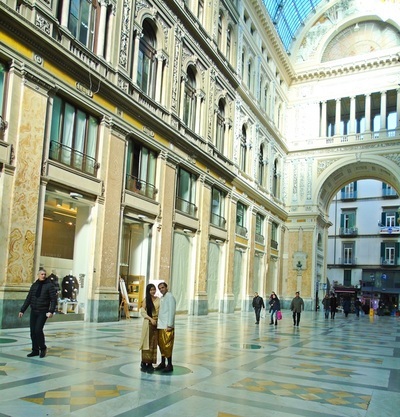 Galleria Umberto I is a public shopping gallery located directly across from the San Carlo opera house. It was built between 1887–1891, and was the cornerstone in the decades-long rebuilding of Naples — called the risanamento (lit. "making healthy again") — that lasted until World War I. Designed by Emanuele Rocco, the Galleria was named for Umberto I, King of Italy at the time of construction. It was meant to combine businesses, shops, cafes and social life — public space — with private space in the apartments on the third floor. When the time to leave Napoli came, Andrew and Mai felt their hearts shrinking - "I know we will be back here for another holiday in the next future and we shall spend more time to visit also the islands of the gulf (Capri, Ischia and Procida)" - said Andrew when they were in the car to the airport to get their flight destination Siracusa to visit Andrew's grandparents. 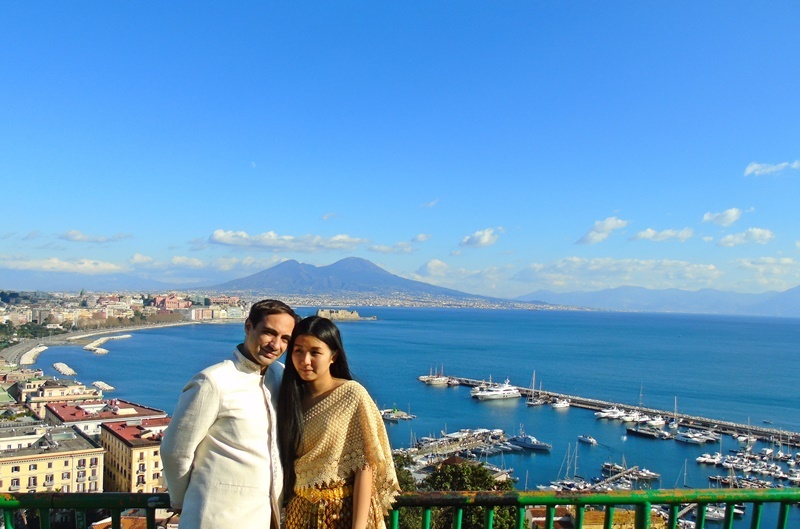 "We will save some money and organize a nice time here - said Mai - food, landscape, art, everything is just perfect here, I feel if I could get used to the way of driving the car here I would be happy to make of Napoli my living place". Andrew smiled and the two were on their way for the flight to next destination.